The Brno Philharmonic recordings is available on Amazon, iTunes, CDBaby, Naxos, or directly from the record label, Ablaze Records. The Lincoln Highway, America's first cross-country highway (established in 1913) connects two very exciting cities: New York and San Francisco. The music heard in the outer movements ("From the Hudson" and "Golden State Romp") represent this vibrancy. Either movement can work as an opener or as a finale, so the piece may be performed "Westward" (I-V) or "Eastward" (V-I). "Metals Heartland," incorporating some metallic percussion, depicts the area sometimes pejoratively referred to as the "Rust Belt" (Pennsylvania, Ohio, Indiana, and Eastern Illinois). "Prairie View" paints the scenery along the Lincoln Highway from the tall-grass prairies of Illinois and Iowa to the mixed- and short-grass prairies of Nebraska and Eastern Wyoming. "Traversing the Mountains" takes the listener along the Lincoln from Wyoming, through Colorado and Utah, and across Nevada. The Eastern terminus of the Lincoln Highway is located in Times Square. The fast tempo of "From The Hudson" (NY, NJ) represents the fast-paced life in New York (City). There are jazz-like elements as well: brass with Harmon mutes, walking bass lines and percussion played with brushes. "Metals Heartland" (PA, WV, OH, IN, IL) opens with the sounds of metal being struck in a mechanical manner, like workers laboring away in a factory. In contrast, a beautiful, soaring melody represents the gorgeous rural views on finds along the Lincoln in this part of the country. "Prairie View" (IL, IA, NE, WY) has a static, gentle and open quality that reflects the open prairies of the Midwest. Its middle section has more motion, and it represents the rolling hills over which the Lincoln navigates. The intimidating mountains of the West are heard in "Traversing the Mountains" (WY, CO, UT, NV) as large, loud dissonant chords. Between these mountains are flat, serene valleys; the gentle melodies between these chords represent the road as it travels through the valleys. The Lincoln's Western terminus is located in San Francisco. The energy found in "Golden State Romp" (CA) mirrors the vibrancy of the Bay Area, and the attractive views of rural California are heard throughout the movement. In 2014, the Sandhills Symphony Orchestra (NE) became the first to perform the entire suite, followed by the DuPage Symphony Orchestra (IL) in 2015. The Brno Philharmonic Orchestra (Czech Republic) recorded the suite in 2017 and commercially released it on Ablaze Records in 2018. The University of Arkansas-Fort Smith Symphonic Band was the first to perform the band version in its entirety. Other orchestras that have performed individual movements from the suite are the Clinton Symphony Orchestra, Dubuque Symphony Orchestra, Joliet Symphony Orchestra, Kansas State University Symphony, Metropolitan State University of Denver Symphony Orchestra, and the Shoreline Symphony (MI). Bands that have performed selections from the concert band version include ensembles from Ashford University (IA), Cornell College (IA), Kirkwood Community College (IA), Kutztown University (PA), Los Angeles Symphonic Winds, Omaha Symphonic Winds, Prairie State College (IL), San Francisco State University, and Winthrop University (SC). 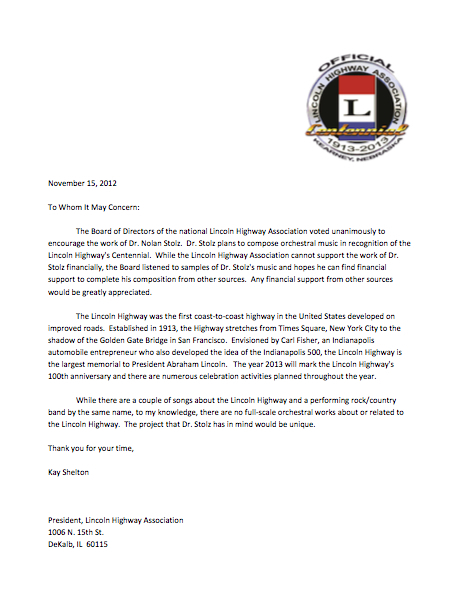 Visit their website (www.lincolnhighwayassoc.org) to learn more about the history of the LH.